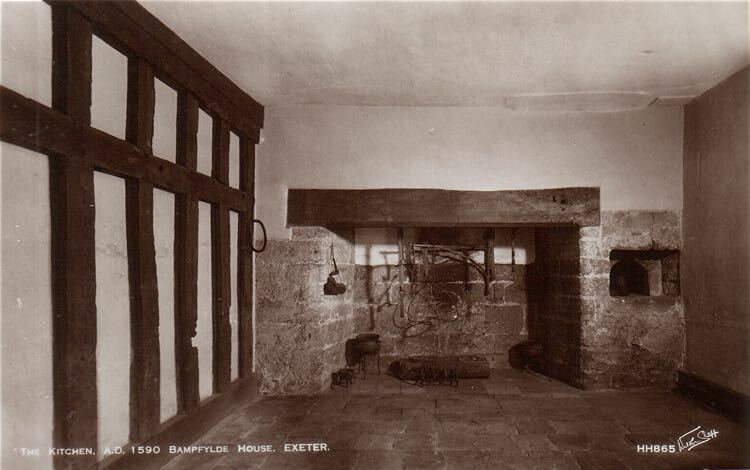 This was the town house of the Bampfylde family, and an important building in the history of Exeter. 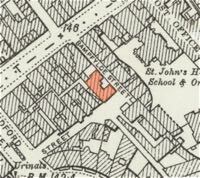 It was the third big loss to Exeter during the May 1942 blitz, in an area now known as Princesshay, the other losses being St John's Hospital School and Bedford Circus. 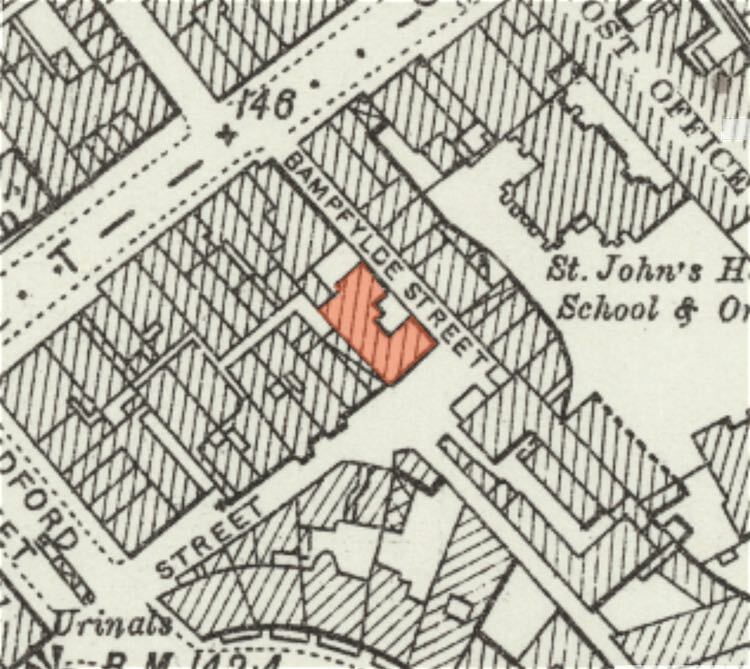 Bampfylde House was located at the intersection of Catherine Street and Bampfylde Street, in the parish of St Lawrence, between St John's Hospital School and Bedford Circus - this is roughly where the arcade that runs from the High Street to the new Princesshay is located. Construction, in an Elizabethan style, started in 1590 under Richard Bampfylde of Poltimore, in a narrow street known as Raden Lane. He was responsible for the installation of several Italian style ceilings before he died in 1594, leaving the house to be completed by his son Sir Amias Bampfylde. Most photographs of the house have been taken from Bampfylde Street and show just the entrance, with not enough width to the street to get the whole of the house into the photo. The house consisted of three stories and a cellar with a small courtyard between the two wings at the front. The rooms facing the street had no windows, to afford some security to the inhabitants. The main hallway had a large room leading off, in which there was installed a chimney piece that reached to the ceiling. 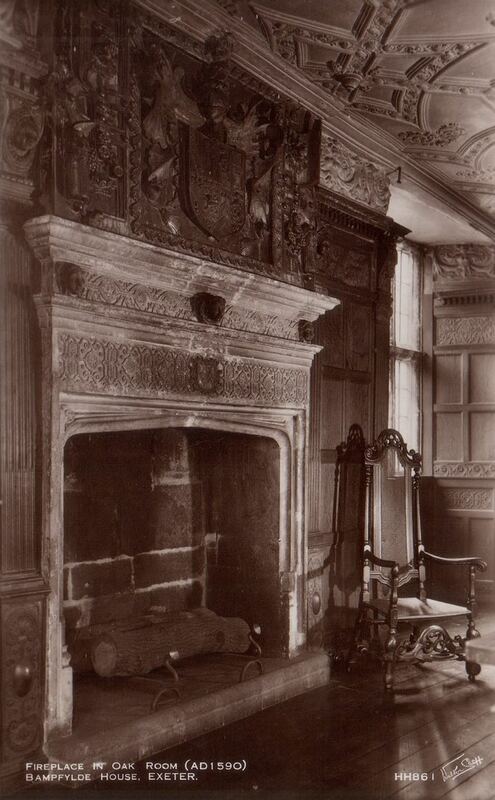 The chimney piece was later removed by Sir Coplestone Bampfylde and installed in Poltimore House, also owned by the Bampfylde's. 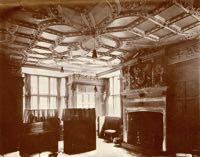 There were three magnificent oak panelled rooms on the first floor and three bedchambers on the top. 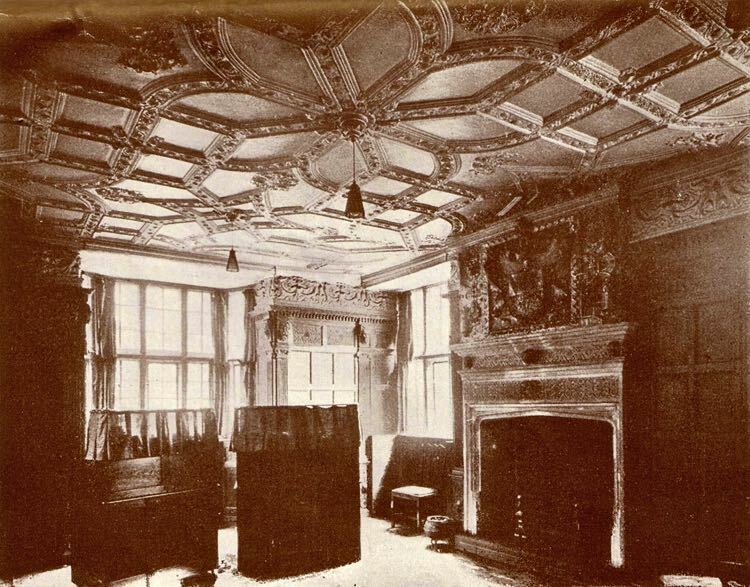 The main room had a fine plaster ceiling along with the oak panelling and a magnificent fireplace over which were the arms of the Bampfylde's, Hasting's, Huxham's, Faber's, Pederton's and St Maur. 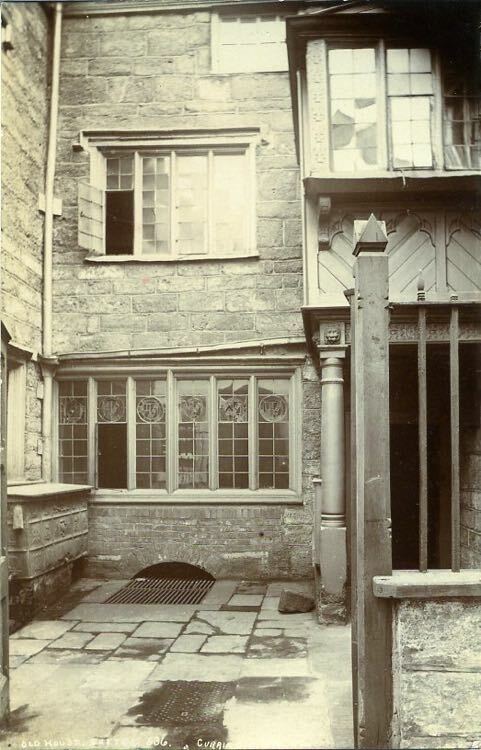 In the small courtyard was a lead water tank, dating from 1724 when George Warwick Bampfylde renovated the house, which had in relief, a stag, three hounds and a standing huntsman with a spear; it was fed by square section gutter pipes that were installed when the house was first built. In 1769, the Duke of Bedford helped negotiate a peace treaty with the French, which allowed them to import silk into the country. This angered the wool merchants of Exeter, who thought they would lose trade. The Duke was given the freedom of the city by the Mayor at the Guildhall for this treaty - during the ceremony the merchants waited for him to emerge, so they could vent their anger. 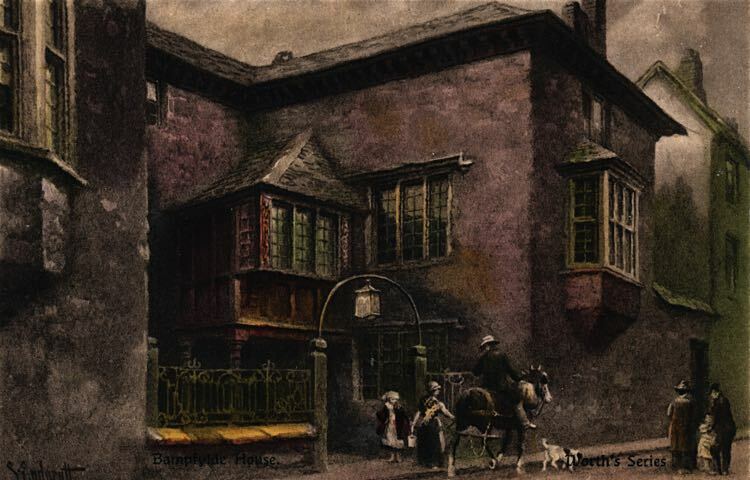 The Mayor tried to get the Duke to Rougemont Castle but was prevented by the mob and he had to take refuge in Bampfylde House, away from the baying crowd. The last of the Bampfylde family to occupy the house was Miss Georgina Sophia Bampfylde, who died in 1814. In August 1816 the Devon County Club occupied the house for a time, followed by a succession of tenants starting with a 'keeper of billiard-tables', while the City Surveyor was based there in 1837. The year later, it temporarily housed the stamp office, until the new post office opened in Queen Street. From 1865, the Public Select Library was housed on the ground floor of the house. It became a Council supported Public Library when it moved to the Royal Albert Memorial Museum in March 1870. While a library it contained the "Library for Young Persons" which was charged to "exclude works of an immoral tendency as well as those of controversial divinity and party politics." The house then was home to the new Exeter School Board. From the number of changes in use, it would seem that the city was at a loss as to the best use of the house. Dymond and Parsons, auctioneers were based at the house during the 1880s and 90s. Robert Dymond, the JP and historian of Exeter (no relation to Dymond and Parsons) wrote a history of Bampfylde House in 1878, which is still an important source for modern historians. In the early 20th century the house gradually deteriorated and was for time occupied by W J Tout, coal merchants. In 1919, Mr Arthur Guest purchased the house from Lord Poltimore and restored it before letting it to an antiques dealer. In 1934, the City Council purchased the property from Mr Guest for £5,000, and opened it to the public as a museum, just before Christmas. The last entry in the newspapers about the house before its destruction from the blitz was in January 1941. The Sheriff offered a large room at the house for the use of the Migrants' Club, that included an Arts and Social Club for those had come to the city because of the war. The 4th May 1942 was a the terrible night of bombing for the city. The house was burnt out by incendiary bombs, leaving the Heavitree stone walls standing, in an area of devastation. It may have been possible to renovate the shell but it was demolished as part of the scheme to clear the whole area for rebuilding. A very similar house from the same period is Great Larkbeare House in Holloway Street. Sources: The Story of Exeter by A M Shorto, an 1878 pamphlet by Robert Dymond held in the West Country Studies Library the 1942 Exeter Guide Book, the Times (1934) and Vincent's Guide to Exeter 1884. Extracts from the British Newspaper Library. The house as drawn by Sidney Endacott. The courtyard in front of the house. The kitchen in Bampfylde House. The fireplace in the main room. The ceiling was in the main living room. 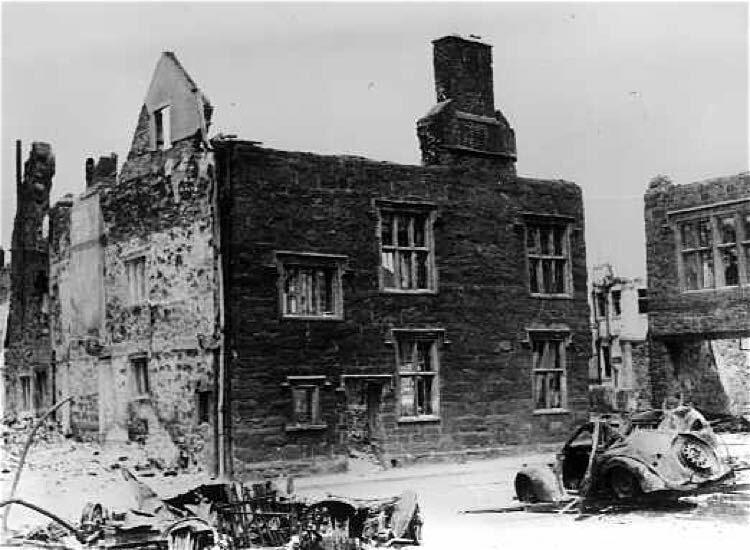 The sorry state of the building after the May 1942 blitz.